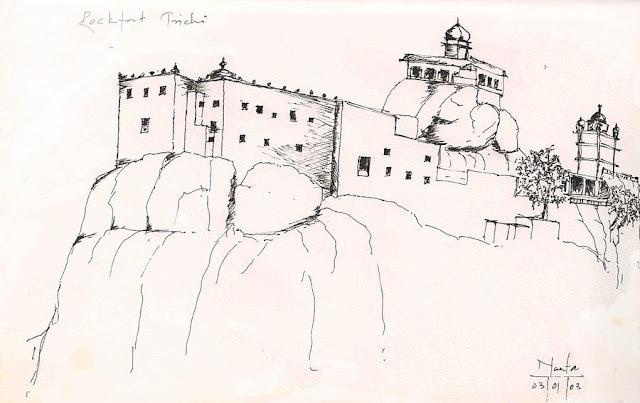 Tiruchirappalli Rockfort is a historic fortification and temple complex built on an ancient rock. This is one of the famous temples near chatram bus stand. There are around 320+ steps here to, climb to the top. The God is Ganesha you can view the city from the top of this hill. There are also snacks counter available in the top. Very interesting to see inside, many steps cut inside this large solid granite rock with smaller temples inside. Make your way to the top for a spectacular view of the city and major rivers. . The Rock fort is the most prominent landmark of the city. Trichy City is a Municipal Corporation, (formerly Trichinopoly in English), also called Trichy, and is a city in the Indian state of Tamil Nadu and the administrative headquarters of Tiruchirappalli District. Trichy is the fourth largest city in Tamil Nadu. Tiruchirappalli is situated in central Tamilnadu on the Cauvery River: dominated by a Rock fort 83M (273 ft) high. Pop: around 1 million.